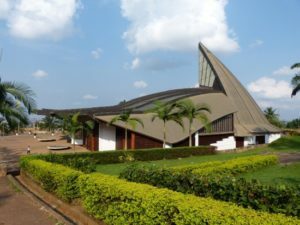 Basilica of Mvolye is one of the place not to miss when you make a tourist stay in Yaounde. 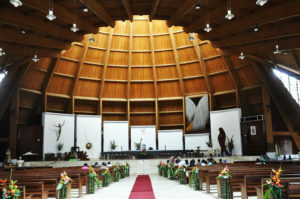 Created in Yaounde in 1998, basilica owes its conception to desire to make a large church to accommodate more people. This translates into program which begins with construction of Mvolye hill followed by the 3500-seat church. The facade is open to widen on a parvis during pilgrimages and major religious celebrations. Manifestation of faith of its designers, the book represents in itself all the greatness they have been able to do. In beginning of 1990, the old cathedral of Mvolye, built by the Pallotine Fathers the Bishop Henri Vieter was destroy. Then Bishop Jean Zoa the successor gives instructions for construction of what will name then “Marian Shrine”. Gigantic project at the time, Basilica of Mvolye has finally come into being and is the object of admiration nowardays. Its a fabulous architectural work with inside an altar made of stone carve in one of the villages in Yaounde. Because of its original form, it imposes admiration and astonishment of the share of all the people who go there. The black Madonna, carved on ebony next to altar is undeniably the attraction of all the works of art. Of course you will find other paintings in bronze and silver, which adorn the walls of basilica outside and inside. The floor is cover with a carefully polish marble, which gives it an apparent solidity. For all lovers of architecture and originality, this is the place you should visit because of his originality. Further building was design sparingly and carefully to represent his name Basilica validly. Basilica of Mvolye welcomes faithful Christian Catholics from around the world. In the same way every Sunday during the office of ecumenical and the few curious to discover.